Green Umbrella - A New Trail for Butler and Warren Counties. Here's the Plan. A New Trail for Butler and Warren Counties. Here's the Plan. Attention residents of Butler and Warren counties: A trail system plan near you is moving forward. Don't you want to know where? 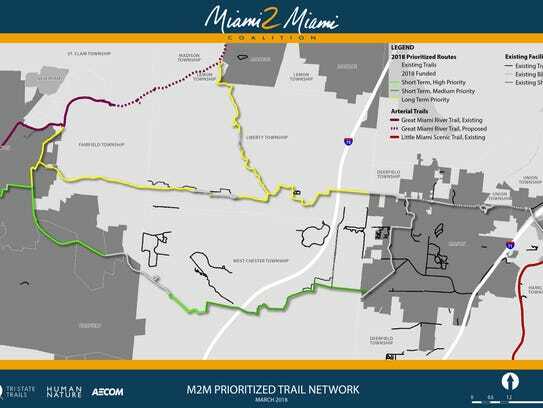 Tri-State Trails, a regional trails advocacy group under Green Umbrella, has reinvigorated the idea of connecting the region's two longest existing trails, the Great Miami Trail to the west and Little Miami Scenic Trail to the east. Called the Miami 2 Miami Connection, the idea was first proposed in 2002, but Tri-State Trails has rejiggered the plan and gained support from all of the communities it would traverse. The original plan was not all off-road and the route changed based on shifts in population and economic development. 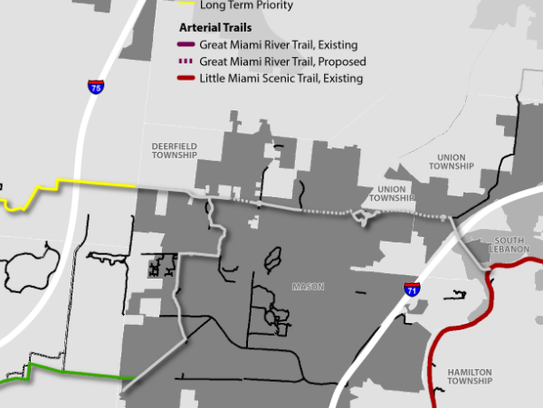 The new vision for the Miami 2 Miami Connection is a paved off-road trail for walkers, runners and cyclists that would travel through the communities of Hamilton, Fairfield Township, Fairfield, West Chester Township, Liberty Township, Mason and Deerfield Township. When fully complete it would link downtown Hamilton, Miami University Hamilton, Union Centre, Olde West Chester, downtown Mason, Voice of America MetroPark, Liberty Center and Countryside YMCA Trail. The short-term priority route is the most feasible and cost-effective connection, said Wade Johnston, Tri-State Trails director. Money still needs to be raised for build-out of the trail system, however. The light green portion in the map above follows the old Miami and Erie Canal route. That's an attractive option because much of that route is publicly owned by the community or county, Johnston said, and owning the land is one of the biggest challenges in trail construction. An open house is planned for those who want to see more detailed maps and provide feedback. It will be held from 6-8 p.m. Thursday, March 8 in Council Chambers at the City of Hamilton, 345 High St. Here are some detail shots of the map. For more information, contact Tri-State Trails at wade@greenumbrella.org.